The winner of today’s best Toastmaster’s speech is Katey. Please join with me in congratulating her. 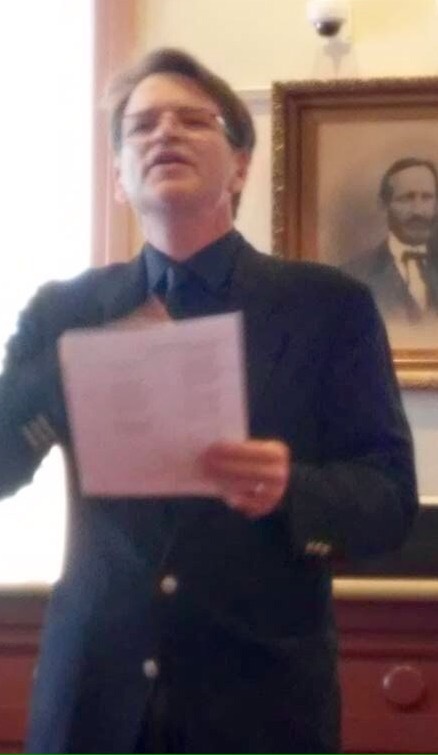 Yesterday I gave a speech at my Toastmasters club. Actually, it was a dramatic poetry reading. More on that in a minute. It went well. Toastmasters clubs really enjoy two things; applauding and voting. We applaud every thing. We applaud whenever someone walks to the front of the room. That happens four times in the first five minutes, and can happen as many as 15-20 times in an hour long meeting. We also vote. . .a lot. We vote for best speech. We vote for the person who evaluated the speech the best. We vote for the best extemporaneous speaker during an event called Table Topics. Getting voted best doesn’t have any lasting meaning, but you do get a ribbon. Generally a Toastmasters meeting will have three speakers. Each speaker will speak for anywher from 5-12 minutes depending on the speech. Mine today was scheduled for 6-8 minutes. I took 6:18. The club members clapped when I was done. However, had I gone over time in my speech, had I taken longer than the allocated 6-8 minutes, I would be ineligible for the voting. In fact, one of the speakers yesterday went too long. He was out of the voting. It was between me and Katy. The winner gets a ribbon. I think I gave the better speech. I voted for Katy. She won. The two poems together we’re just over six minutes. Perfect. I would have time to pause in the reading without worrying about time. I hate the idea of going long. 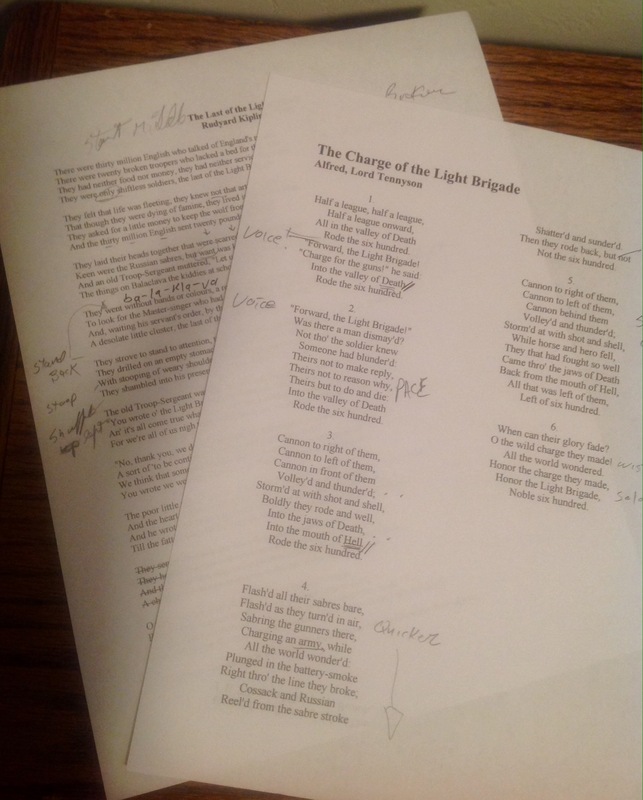 I practiced both poems several times before yesterday’s noon meeting. Interpretive reading is designed to be read, not memorized. I felt well prepared. I was the first speaker. I was struck by my reaction to the words written so many years ago about a battlefield that I honestly couldn’t find on a map. My pauses went from being scripted to being genuine efforts to compose myself as I described first the astounding sacrifice and then the harrowing deprivation of these men dead more than a century ago. The cracks in my voice were real. The performance was one of my best. Katy did a wonderful presentation on how to comfort so who are suffering. Her voice didn’t crack. She didn’t have any purposeful pauses. When it came time to vote, I felt I’d done a better job. I still voted for Katy, because I always vote for the other speaker. I rarely even vote for the person who evaluates my speech for best evaluator. I don’t know what the results of the voting were. By that I mean I don’t know how many votes Katy beat me by. But, had I lost by a single vote, I would not have regretted my vote. It’s a poor performer who is his own cheerleader. 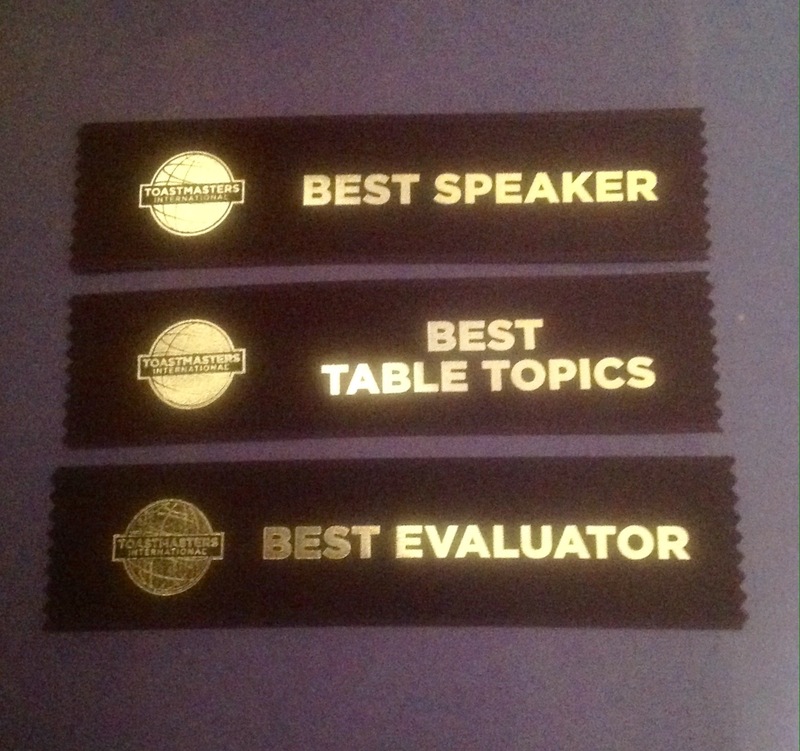 If I have done my preparation correctly, I should always think I deserved best speaker. Why wouldn’t I? I understand the work that went into my performance. I know about the rough drafts, the efforts to tease out the emotion in a text. I know the depth and energy I put into it. I don’t understand that about anyone else. I am judging not only my performance, but my preparation. Evaluated against someone else’s performance, my perception is biased. And I enjoy winning. No doubt about it. I was disappointed when Katy’s name was ready. But, I don’t want to be rewarded by default. I want to be the best speech of the day. I give speeches to entertain. Today more than most days was a performance. The ribbon doesn’t make any difference to how well I perform. The ribbon is handed out afterward. My winning it or not winning it has no reflection on my speech. Knowing my vote is going to the other speaker makes me that much more determined to do well. Like spotting someone 1 point at the start of the game., I want to make sure that if the club picks me, I know I earned it. If I don’t win, I know that I can get better. I’m speaking next week again. I’m guilty of having voted for myself on occasions that I felt I deserved, but I love the point you made here. I’m adopting this practice of voting for others no matter what. Unless money is involved, then I’ll always vote for me. Great article and thanks for sharing!